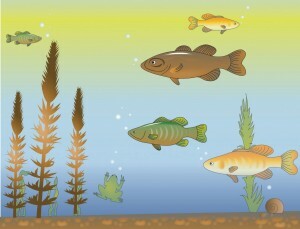 Masuda and Nisbett (2001) asked American and Japanese students to describe what they saw in images like the one shown in Figure 5.3.1, “Cultural Differences in Perception.” They found that while both groups talked about the most salient objects (the fish, which were brightly colored and swimming around), the Japanese students also tended to talk and remember more about the images in the background (they remembered the frog and the plants as well as the fish). Richard Nisbett and his colleagues (Nisbett, Caputo, Legant, & Marecek, 1973) had college students complete a very similar task, which they did for themselves, for their best friend, for their father, and for a well-known TV newscaster at the time, Walter Cronkite. As you can see in Table 5.3.2, “The Actor-Observer Difference,” the participants checked one of the two trait terms more often for other people than they did for themselves, and checked off “depends on the situation” more frequently for themselves than they did for the other person; this is the actor-observer difference. There are other, related biases that people also use to favor their ingroups over their outgroups. —The group attribution error describes a tendency to make attributional generalizations about entire outgroups based on a very small number of observations of individual members. This error tends to takes one of two distinct, but related forms. The first was illustrated in an experiment by Hamill, Wilson, and Nisbett (1980), college students were shown vignettes about someone from one of two outgroups, welfare recipients and prison guards. They were then asked to make inferences about members of these two groups as a whole, after being provided with varying information about how typical the person they read about was of each group. A key finding was that even when they were told the person was not typical of the group, they still made generalizations about group members that were based on the characteristics of the individual they had read about. This bias may thus cause us to see a person from a particular outgroup behave in an undesirable way and then come to attribute these tendencies to most or all members of their group. This is one of the many ways that inaccurate stereotypes can be created, a topic we will explore in more depth in Chapter 11.